Newton-Wellesley Hospital provides free and confidential domestic and sexual violence services for both survivors of domestic and sexual violence and health care providers. The Hospital program works to provide comprehensive, culturally-competent care specific to the needs of the individual survivor. Domestic violence and sexual trauma affects people of every race, culture, faith, age, gender identity and sexual orientation. People with disabilities, undocumented immigrants and transgender individuals face additional risks. If you are in immediate danger, please call 911. 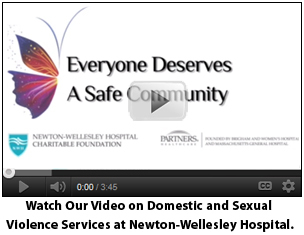 For more information about Domestic and Sexual Violence Services at Newton-Wellesley Hospital, please call 617-243-6521.